To-date, no complete ethnological study of the White Majorcan ovine breed, a local indigenous breed restricted to the Balearic Islands, has been published. In order to contribute to the knowledge of this breed, in particular of its wool, fleece samples from 20 different adult animals were studied. Each sample was analyzed for wool yield, fibre diameter (fineness), fibre curvature, medullation (%), kemp (%), F30 (percentage of fibres with a diameter < 30 µ), length and proportion of short and long fibres, and crimp. For the wool yield, enlarged samples of 69 adult animals were studied (average 42.2±8.6 kg). The mean fibre diameter was 32.1 μm, with the values ranging from 4 to 149, presenting a clear skewed-to-coarse distribution. Mean curvature was 57.6. Percentages of medullation were very low (4.1%), as were those of kemp (0.008%). F30 showed a value of 52.6%. Short fibres were more abundant than long ones (1:1.3). The total wool weight ranged from one to two kg (4.4% of the body weight). All these fleece and wool characteristics of White Majorcan, that can be classified as a “medium-wool breed”, would indicate that this breed can be clearly differentiated from the rest of the Mediterranean group, which presents a coarse, mixed-wool fleece with a long, straight outer coat and short undercoat. The White Majorcan (“Blanca Mallorquina”) is indigenous sheep breed to the island of Majorca and being the most widely on the Balearic Islands (FEAGAS) (http://feagas.com/images/stories/portal/actividades/biodiversidad/2011-2012/resultados/ OVINO.pdf). Males present a wither height of 73 cm and a weight of 60 kg, while females present a height of 65 cm and weight of 40 kg, on average (http://dad.fao.org/). The breed is reared in very extensive system, and feed is mainly confined to levels that sheep obtain during grazing . This breed is mostly raised for meat production whereas wool is currently being a residual income for the farmers. Animals are shorn every 12 months. According to the estimates of FEAGAS (http://feagas.com/images/stories/portal/actividades/biodiversidad/2011-2012/resultados/OVINO.pdf), there are 12,258 pedigreed animals (275 rams and 11,983 ewes), distributed in 103 Majorcan farms (2012). The more general details of the breed are provided in http://www.racesautoctones.com/index.php?id=6 and http://feagas.com/images/stories/portal/actividades/biodiversidad/2011-2012/resultados/OVINO.pdf. This breed is related to the sheep of the Mediterranean islands, such as the Majorcan Red, Menorquina, Formentera, Ibicenca , all four of which habitat on the Balearic Islands, (Corsican, Sardinian and Sicilian sheep (http://dad.fao.org/), and Cretan sheep. The large number of breeds from the Mediterranean area has in common a coarse, mixed-wool fleece with a long, straight outer coat and short undercoat. In majority of the cases, this wool pattern corresponds to animals of small or moderate size with a strong constitution, naturally adapted to optimal use of marginal regions such as mountainous, semi-mountainous, arid or semidesert areas, suitable for production of milk, meat and wool. Indigenous sheep breeds are an important storehouse of genetic materials due to acclimatization to local, sometimes harsh environmental conditions, nutritional fluctuations and resistance to diseases and parasites . Apart from preventing extinction, conservation of indigenous breeds is also important for the future health of the animal industry globally, as they can be a resource for novel genes that permit sustained genetic improvement as well as enabling adaptation to changing breeding objectives and environments . However, in order to ensure proper conservation and utilization of indigenous breeds, it is necessary to evaluate genetic variations that exist within and among breeds . Diversity of indigenous insular breeds in the Mediterranean basin has not been sufficiently studied. To the best of our knowledge, no studies have been undertaken on the features of the wool characteristics of the White Majorcan sheep breed, although the importance of wool characteristics and their variations have long been recognized as valuable tools to describe a breed of sheep [6,7]. Fleece characteristics have also recently been used as valuable techniques to trace ovine breed phylogenies . Accordingly, the present work was designed to identify some characteristics which are of primary importance both for ethnological descriptive purposes and for future use of this breed’s wool. This study should be considered as a preliminary analysis, on the level of conventional wool analysis, applied to ethnological purposes. The data for this study were obtained from 20 adult animals, aged at least 2 years, from 14 different Majorcan flocks. Animals were managed extensively, sometimes with supplementary feeding in critical periods, such as late summer. Only pure breed animals with apparent good health were used for this study. Wool collection was performed during shearing between the months of April and July 2014. Ethical approval was not required, as sampling did not represent any injury to animals. Fleece samples were manually pulled from the shoulder region and kept in thick paper bags for further analysis. Each fleece was subsequently subjected to objective measurements of fibre diameter (fineness), fibre curvature, medullation (%), kemp (%), F30, length and proportion of short and long fibres. Fibre diameter was measured by lanometer (OFDA 100); a total of 252,000 measurements were taken. The proportion of each type was calculated, expressed as a percentage of the total fibre number. F30 was calculated as the percentage of fibres with a diameter <30 μ. Overall means were calculated as the average of each measurement. Wool analysis was performed at the Wool Testing Authority Europe Ltd (Wales). An extensive description of the analytical method for each trait is mentioned in the thesis submitted by first author (available at http://www.tdx.cat/handle/1 0803/5709;jsessionid=45A6D5732E0F1711109469BC2CB77E51.tdx1). Length of short and long fibres including crimp was evaluated under microscope (30 fibres per animal). For the wool yield, a sample of 69 animals (5 males and 64 females) was studied to the nearest 0.01 kg, from which crude wool weight and body weight were obtained. Data were analysed using PAST . Descriptive statistics for the traits were studied and are shown in Table 1. The mean fibre diameters ranged from 4 μm to 149 μm, with an overall mean diameter of 32.1 μm. The average diameter obtained was higher than that observed in other Mediterranean breeds of sheep, such as Majorcan Red  and Cretan sheep-Sfakia, Sitia and Psiloris-, but clearly below that of fat-tailed breeds, such as Awassi . These authors reported 27.9 μm for Majorcan Red, 45.3, 36.8 and 38.0 μm for Sfakia, Sitia and Psiloris, respectively, and 36 μm for Awassi. Diameters presented a high variation (coefficient of variation 33.9%) and the modes ranged from 21 to 33 μm with a mean mode of 26 μm, thus enabling us to classify White Majorcan as a “mediumwool breed” . Distribution was clearly unimodal with a skewed-to-coarse distribution (Figure 1), probably due to the intake of green feed (fibre diameter (blow out) increases after the break of season, adding to variation along wool fibres) . According to diameter mean value-which influences both wool quality and staple strength-, the breed’s wool is composed mainly of nonmedullated fine short fibres (<35 μm). Fine wool is used in a large number of clothing products and is much softer on the skin than coarse wool, allowing it to be used in valued apparel products. As non-medullated fine wool provides inner insulation, the thermal protection of the breed’s wool must be viewed as prevalent above mechanical protection, which would be provided by medullated and coarse fibres (>35 μm) . Carpet wool in European sheep presents a mean fibre diameter of 34-49 μm . There was virtually no kemp (0.008%, including zero values). The proportion of medullated fibres ranged up to 14.4%, with an overall mean of 4.1%. Short fibres (6.9 ± 2.6 mm) were more abundant than long ones (12.7 ± 5.0 mm) (1:1.3). The fleece weight is from 0.81 to 3.86 kg (average: 1.8 kg, for an average body weight of 42.2 ± 8.6 kg), clearly above Mediterranean carpet wool breeds, such as Corsican, Sardinian and Sicilian. We must obviously be cautious about this yield, as there is a well-documented positive relationship between wool growth, live weight and live weight changes [14,15]. Table 1: Mean values for the raw traits measured in the study of 20 adult animals belonging to “White Majorcan” sheep breed, from 14 different Majorcan flocks. 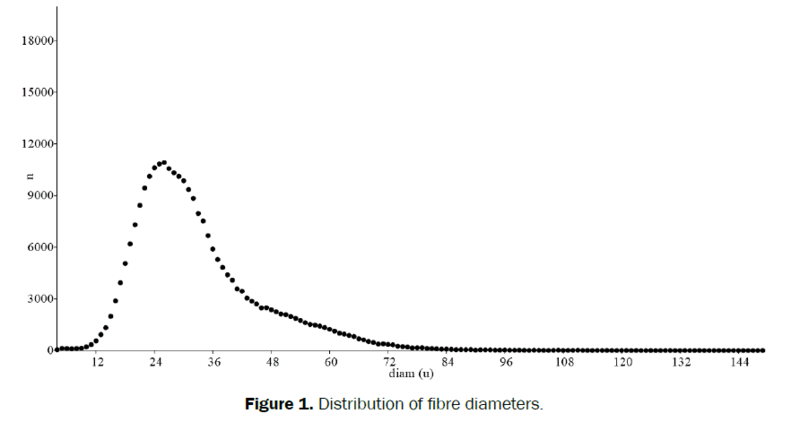 Figure 1: Distribution of fibre diameters. The White Majorcan breed differs from the typical carpet wool breed of the Mediterranean, as it has a short undercoat with a poor long straight outer coat. The good quality of wool indicates their possible use in the niche of typical local products, giving a possible chance to the economic competitiveness of this breed. In this context, a stringent future genetic selection plan with aim of quantitative and qualitative improvement of meat production including maintaining the breed’s rusticity characteristics are required. The breeding criterion should be considered in the harsh environmental conditions where White Majorcan sheep habitat, so as to ensure strongly selected and well adapted animals. The traits must be determined on the basis of the ewes’ rearing capacity, measured according to growth of the lambs; the numerical productivity should be measured by recording age at first birth, interval between births, prolificacy, number of lambs weaned, and wool traits. In relation to this latter non-productive trait, such as fibre characteristics should be incorporated to provide guarantee in future. From a geographical point of view, the White Majorcan is included in the insular Mediterranean group, composed mainly of coarse-wool breeds with few external genetic influences from the Spanish mainland breeds in the case of Balearic Islands . The role of the Mediterranean Sea as a natural corridor connecting South West Europe to the Near East and North Africa is absolutely plausible for domestic sheep, that are moreover adaptable to various environments and are easy to transport due to their size . As, historically, Balearic settlers may have improved local livestock by importing stock from overseas , this would explain high within-breed diversity. Furthermore, it is not surprising that fleece characteristics of White Majorcan would indicate clear difference from the rest of the group. More genetic and phenotypic (including fibre) studies for this and other insular sheep populations will, however, help to relate local sheep populations in the Mediterranean basin, including those from continental North Africa and the Near East. Very special thanks are extended to the farmers who facilitated sample collection from their herds. Goyache F, et al.Análisisdemográfico y genético de la razaovinaMallorquina. ITEA.(2010);106:3-14. Pons AL, et al. The biodiversity and genetic structure of Balearic sheep breeds. Journal of Animal Breeding and Genetics.(2015);132:268-276. Galal S, et al.Awassi sheep as a genetic resource and efforts for their genetic improvement review. Small Ruminant Research.(2008);79:99-108. Notter DR, et al. The importance of genetic diversity in livestock populations of the future. Animal Science.(1999);77:61-69. Esteban C.RazasGanaderasEspañolas. II. Ovinas. FEAGAS & MAPA, Madrid. (2003). Pares P-M, eta l. The Aura-Campan ovine breed: a reminiscence of merinisation in the Central Pyrenees. REDVET VIII (2007a);10. Pares P-M, et al. Comparative Analysis of Fleece in different Spanish and French Sheep Breeds. VIII SimposioIberoamericanosobreConservacion y Utilización de RecursosZoogeneticos. Quevedo (Ecuador).(2007b). Hammer O, et al. PAST: Paleontological Statistics Software Package for Education and Data Analysis. Palaeontologia Electronica.(2001);4(1). Pares P-M, et al. Diversity and breed comparison of wool parameters in 31 different American and European ovine breeds. In: Fibre Production in South American camelids and other fibre animals. In: Pérez-Cabal, et al. (Edns). Wageningen Academic Publishers. The Netherlands. (2011). Tabbaa M, et al.. Variation in fleece characteristics of Awassi sheep at different ages. Small Ruminant Research.(2001);41:95-100. Coop IE. Sheep and goat production. Elsevier. Amsterdam. (1982). Ansari-Renani HR, et al. Determination of Wool Follicle Characteristics of Iranian Sheep Breeds. Asian-Aust. J Anim Sci. (2011);24:1173-1177. Masters DG, et al. Influence of liveweight, liveweight change, and diet on wool growth, staple strength and fibre diameter in young sheep. Australian Journal of Agricultural Research.(1998);49:269-277. Peterson AD, et al. Staple strength-Management of staple strength on-farm. Asian-Australasian Journal of Animal Sciences.(2000);13:22-24. Pereira F, et al. Genetic signatures of a Mediterranean influence in Iberian Peninsula sheep husbandry. Molecular Biology and Evolution. (2006);23:1420-1426.